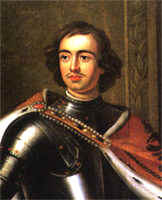 In this section you will learn about Peter the Great, founder of St Petersburg, what the French emperor Napoleon did to Russia, what happened to the last tsar and his family (his son Alexei and four daughters, one of whom was Princess Anastasia), and how Russia turned into the Union of Soviet Socialist Republics or USSR at the beginning of the 20th century. 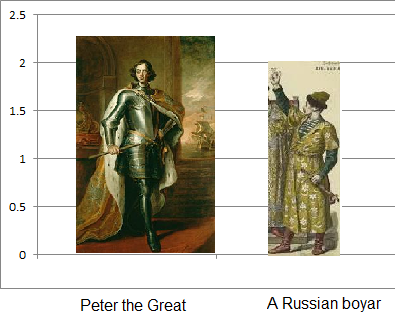 Peter was Michael Romanov’s grandson and under his rule Russia underwent many changes. It was Peter who made Russia one of Europe’s great powers and who helped it recover from the scars left by Ivan the Terrible. He did this firstly by opening Russia to the West. He wanted Russia to be as modern and advanced as Europe and poured all the country’s money and resources into making it a kind of European paradise. He asked the best Western engineers, craftsmen, merchants and shipbuilders to come to Russia and help him to modernise it. He also sent thousands of Russians to Europe to learn these trades and receive the best education possible. He even went himself – and worked in the shipyards of Holland and England. In 1703 Peter declared that a town was to be built on the boggy marshlands of the delta of the Neva River. Over several years of frantic and often difficult construction, a city emerged. It was called St Petersburg, and Peter made it the capital of Russia instead of Moscow. St Petersburg was built to be a work of art, whose beauty would rival that of any European city. In fact, many early European visitors to St Petersburg described it as resembling a theatre set, such was its uniform and somewhat unnatural beauty. He tried to change Russia from what he thought was a deeply archaic, superstitious and closed country into a modern haven of European civilisation. To do this, he took extreme measures to make everything in St Petersburg exactly how he wanted it: he told his nobles how to live, how to build their houses, how to cut their hair, where to stand in church and how to converse politely in society. In one of his most radical reforms, Peter made the Boyars servants of the crown. In this way he laid the foundations of an 18-19 century European-style absolutist state, where the monarch reigns supreme. The new aristocracy was suddenly totally defined by its position in the civil and military service and its rights and privileges were set accordingly. In a surprising twist Peter even banned beards across all classes. 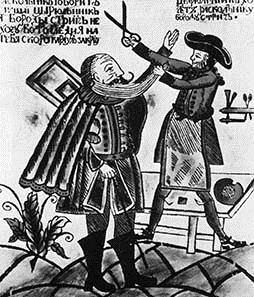 This was a particular blow to the Boyars who wore theirs long in the Orthodox style, but all Russian men were subject to the law. To help enforce it, Peter even introduced a Beard Tax, payable if you refused to shave your beard! He also made big changes to improve the economy, education and Russia’s military strength. He built up the army and the navy, making Russia a real military force to be reckoned with. In particular the Russian navy was really created by Peter who had hundreds of ships built by foreign experts. Although we can see that Peter did much to modernise and empower Russia, we can also see why many did not enjoy Peter’s reforms. After all, by forcibly Europeanising Russian life he was trying to rid Russia of much of her cultural history and heritage. Of course, he was not completely successful and much of the old Russia remained, especially outside of St Petersburg. Pushkin's African-born ancestor Abram Ganibal (see Pushkin's life) was one of the people Peter sent abroad to study. If he hadn't been educated maybe Russia wouldn't have had such a wonderful poet! Peter wasn’t just Great because of all the changes he made. As you can see from the chart below he was also HUGE. He was 2.03 metres tall. The average Russian in those days was just 1.63 metres tall. Peter is taken from a portrait by Godfrey Kneller, 1698. This portrait was Peter's gift to the King of England. The boyar is from "Russian costumes. Boyar. 17 and 18 centuries"
How tall are you? Download this chart and compare yourself yourself and your friends to Peter and his boyars. French Emperor Napoleon was becoming annoyed with the Russians and their Tsar, Alexander I. Napoleon had placed a European-wide ban on trading with Britain, mainly because it was almost the last remaining European country that wasn't answerable to him. But the Russians kept breaking the ban because it was bad for their own trade. So in 1812, to teach the Russians a lesson, Napoleon decided to invade. It turned out to be a huge mistake. He hadn’t planned for the terrible road network in Russia, making progress slow. The farms didn’t grow nearly enough food to support the gigantic army of 500,000 men and 50,000 horses he had taken with him. Soon they were starving, exhausted, and ridden with disease. As a final blow, the bitter Russian winter came. While Napoleon’s and Alexander’s troops did take part in some fierce fighting, in the end the French army could not cope with the harsh Russian conditions. Eventually, defeated, Napoleon decided to go home to France. Before he left Moscow he set it on fire. His armies had a terrible journey home and by the time Napoleon returned to France, only a fraction of his men were left alive. One important consequence of this invasion was that some Russians began to reject the Europeanisation that had become such a large part of Russian life since Peter the Great. They wanted to go back to their roots, and to make Russia Russian once again, rather than an imitation of a culture and history that weren’t even theirs. Slowly and over a long period of time, Russia began to recover its own culture, heritage and style. The Romanov dynasty came to dramatic end in 1917 under the rule of Tsar Nicholas II, through an event commonly known as the Russian Revolution. L-R: Maria, Tsarina Alexandra, Olga, Tatiana, Tsar Nicholas, Anastasia and Alexei. Tsar Nicholas II was married to a German Princess called Alexandra. Together they had five children, four girls – Olga, Tatiana, Maria and Anastasia - and a much wanted son, Alexei. Nicholas was a devoted family man and he and Alexandra had a very happy marriage. Unfortunately however, Nicholas was not a very competent Tsar. He was autocratic but lacked authority and confidence. Too often in the years before the Revolution, Nicholas made bad decisions, such as going to war with Japan in 1904 when the country could not afford it and was ill-prepared. Russia’s subsequent defeat led to riots and strikes, and in 1905, on a day now known as Bloody Sunday, demonstrators asking for changes were shot on Nicholas’ order. The Russian people were poor, hungry and dissatisfied and Russia was ripe for revolution. In response to the growing crisis, Nicholas first reduced some of his own power by forming a government but this was not enough, and he abdicated in February 1917. A provisional government was formed but in October 1917 a man named Vladimir Lenin took advantage of the weakened state and staged a coup d’état: he took control of Russia. Lenin speaking to crowds in Moscow in 1917 Credit: "Lenin-Trotsky 1920-05-20 Sverdlov Square (original)" by G. Goldshtein. This source can be found in various publications on the subject of early Soviet history, including Robert Service, 2000, Lenin: A Biography (London: Macmillan). Lenin was a Socialist, which meant that he believed in a society where all individuals were equal. This would be assured by ensuring that all means of production and all resources were common to all people, rather than being owned by just a few people. It was a radically different way of thinking from the old Tsarist regimes, which had ruled Russia for all its history. This was the start of a new era for Russia. Lenin was worried that the Romanovs would try and retake power, so he imprisoned Nicholas, Alexandra and the children in 1917 before eventually killing them in 1918. For decades there were rumours that the youngest daughter, Anastasia, and her brother Alexei had survived and were secretly living in Russia. There was even a woman in America who claimed to be Anastasia. But in 2007, the bones of Anastasia and Alexei were found near those of their parents and siblings, and the rumours were finally put to rest. For more about Lenin see Russiapediia/Lenin. For more about Nicholas II see Russiapedia/Nicholas. For more about the Revolution see Russiapedia/Revolution.